What Is Happening in My Classroom? "The Scholarship of Teaching and Learning in Religious Studies"
In 2014, a roundtable on pedagogy appeared in the Journal of the American Academy of Religion with an initial piece by Vanessa Sasson. 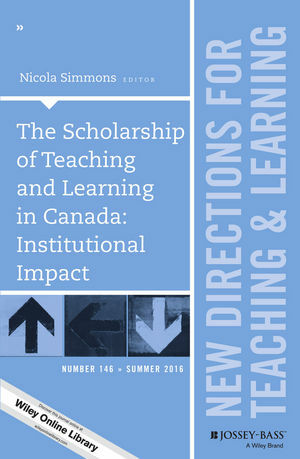 Although neither Sasson nor the respondents explicitly situated her article as a part of the broader body of work known as the “ Scholarship of Teaching and Learning” (SoTL), readers would reap benefit from such a contextualization. 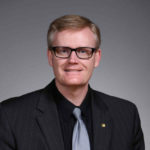 In this article, after first exploring what SoTL is and how it has interacted with the field of religious studies, I explore three main elements of this particular kind of scholarship: research with human subjects and the Institutional Review Board, a foundation in other scholarship, and assessment. In these three areas, I uncover special questions, considerations, and resources for all religious studies instructors interested in embarking upon a SoTL project with the aim of contributing to the ongoing conversation about pedagogy. 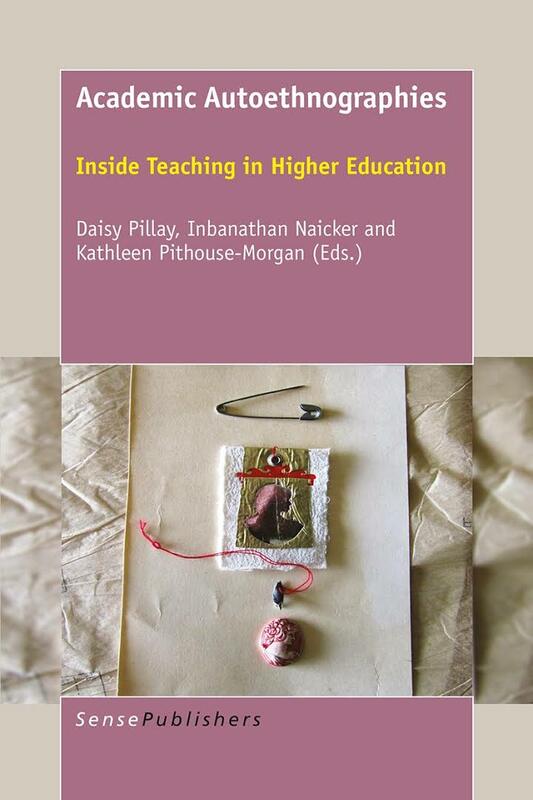 Pillay, Daisy; Naicker, Inbanathan; Pithouse-Morgan, Kathleen, eds. 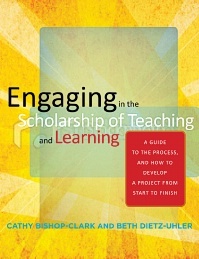 This chapter provides the structure of a Community of Learners using a Scholarship of Teaching and Learning framework. Building on classical and recent studies of the learning paradigm of higher education, the author distinguishes between receiving ideas and using them and how universities might educate students to be more open to the world, open to discovery and creativity. This chapter is a description of the utilization of SoTL concepts and Brookfield’s Critical Incident Questionnaire in an evidence-based medicine course in physician assistant education. This chapter describes the most commonly used pedagogical practices in the clinical mental health discipline and provides examples from a SoTL project along with reflections on the process of designing, facilitating, and analyzing the research. A teacher educator describes how she shares ongoing SoTL research about her students’ writing with the students themselves, and how this process influences teaching and learning. Two educators provide an overview of what they have learned about the Scholarship of Teaching and Learning related to the education of future physical therapists and describe how they and their colleagues on faculty are integrating it into their academic lives. Information literacy, rather than being mere library jargon, encapsulates the pedagogical core across all disciplines; this chapter discusses the active role librarians can play as collaborators in small-scale or campus-wide initiatives to improve teaching and learning. - continuing challenges with this work. Helen Bradbury, Faculty of Heal Leeds Metropolitan Uni, Sue Kilminster, Miriam Zukas, eds. Reflective practice has moved from the margins to the mainstream of professional education. However, in this process, its radical potential has been subsumed by individualistic, rather than situated, understandings of practice. Presenting critical perspectives that challenge the current paradigm, this book aims to move beyond reflective practice. It proposes new conceptualisations and offers fresh approaches relevant across professions. Contributors include both academics and practitioners concerned with the training and development of professionals. Definitions of reflection (which are often implicit) often focus on the individual's internal thought processes and responsibility for their actions. The individual - what they did/thought/felt – is emphasised with little recognition of context, power dynamics or ideological challenge. This book presents the work of practitioners, educators, academics and researchers who see this as problematic and are moving towards a more critical approach to reflective practice. Although academic identity has received attention in the literature, there have been few attempts to understand the influence on identity from engagement with the Scholarship of Teaching and Learning (SoTL). In this paper, we (a group of eight scholars from five different countries) describe how our interactions with SoTL have impacted the shaping of our academic identities. We have struggled to define the value, purpose, outcomes, and meanings of being a disciplined SoTL scholar, sometimes in addition to and sometimes in opposition to being a disciplinary scholar. Through analysis of our own 100-word reflective narratives, we identify common conflicts and configurations around our experiences of developing a SoTL identity. We describe how navigating among conflicting identities can lead us into a troublesome but deeply reflective liminal space, prompting profound realizations and the reconstruction of academic identity. Drawing on this notion of liminality helps us to understand our journeys as moving through a necessary and important transformational landscape, and allows us to suggest ways to support those engaging with SoTL to develop an integrative SoTL identity. Kennesaw’s Center for Excellence in Teaching and Learning maintains one of the most extensive directories of conferences focused on college/university teaching and their sponsoring organizations. "The Wabash Center in the Scholarship of Teaching"
The Wabash Center for Teaching and Learning was established in the wake of heightened interest in teaching and learning following Ernest L. Boyer's 1990 Carnegie Foundation report on the professoriate. The Center was established specifically to strengthen teaching and learning in theology and religion. The praxis of Wabash Center programs directed to that quest, however, inevitably engaged participants in the scholarship of teaching and learning by highlighting questions from their teaching practice, the disciplinary shape of their teaching, and the influence of multiple publics on what and how they taught. The first seven volumes of the American Academy of Religion's "Teaching Religious Studies" series provide informative glimpses of how teachers in very different contexts understand the intellectual decisions, strategies, and actions that constitute their craft. Although individual volumes have different formats, the dominant image of good teaching that emerges is that it is founded on deep and sophisticated knowledge of the particular subject matter. Beyond that, many essays provide instructive anatomies of particular syllabi, moments in the classroom, or other aspects of teaching. Much of the material in the essays comes from reflective practitioners and there is relatively little sustained engagement with the contemporary literature on teaching and learning. 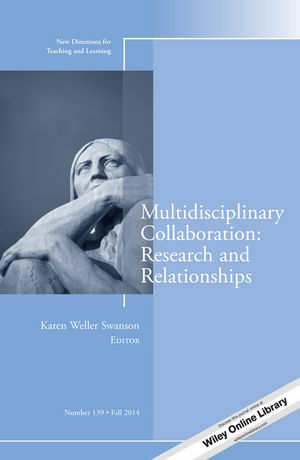 Nonetheless, virtually any teacher can find in these volumes stimulating reflections on the intersections of substantive research and pedagogy in a variety of classroom contexts. Winkelmes , Mary-Ann; and Burton, Antoinette, eds. Abstract: What does it mean to be authentic? Why should it matter whether or not we become more authentic? How might authenticity inform and enhance the social practice of the scholarship of university teaching and, by implication, the learning and development of students? Authenticity in and through Teaching introduces three distinct perspectives on authenticity, the existential, the critical and the communitarian, and shows what moving towards greater authenticity involves for teachers and students when viewed from each of these angles. 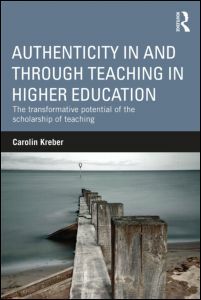 In developing the notion of ‘the scholarship of teaching as an authentic practice', this book draws on several complementary ideas from social philosophy to explore the nature of this practice and the conditions under which it might qualify as 'authentic'. Other concepts guiding the analysis include ‘virtue’, 'being', ‘communicative action’, 'power', ‘critical reflection’ and ‘transformation’. Authenticity in and through Teaching also introduces a vision of the scholarship of teaching whose ultimate aim it is to serve the important interests of students. These important interests, it is argued, are the students’ own striving and development towards greater authenticity. Both teachers and students are thus implicated in a process of transformative learning, including objective and subjective reframing, redefinition and reconstruction, through critical reflection and critical self-reflection on assumptions. It is argued that, in important ways, this transformative process is intimately bound up with becoming more authentic. Rather than being concerned principally with rendering research evidence of ‘what works’, the scholarship of teaching emerges as a social practice that is equally concerned with the questions surrounding the value, desirability and emancipatory potential of what we do in teaching. The scholarship of teaching, therefore, also engages with the bigger questions of social justice and equality in and through higher education. ch. 7 When is Student Teaching Teacher Education? • What is meant by the scholarship of teaching and learning in higher education? • What is the purpose of higher education? • Are lecturers really 'students' on these courses? • How do you do 'reflective' writing? • What do we do with all this theory and jargon? • What does CPD in this area involve? • How do you do 'research' on teaching and learning? This book does not treat each element of the curriculum separately – course design, assessment, evaluation of teaching etc. – since that approach has been well handled by others. Instead, like other books in the series, it addresses elements of the curriculum in an integrated way, thereby educating the reader in how to approach a range of higher education related issues. The cases that constitute this volume represent work in progress by faculty selected as Carnegie Scholars with the Carnegie Academy for the Scholarship of Teaching and Learning (CASTL). 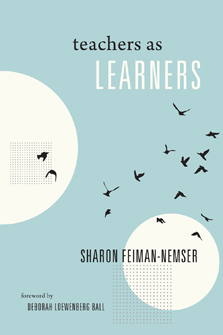 Each of the eight authors tells the story of her or his efforts at “opening lines” of inquiry into significant issues in the teaching and learning of the field. In particular, their accounts focus on the doing of this kind of investigative work – that is, on methods and approaches for undertaking the scholarship of teaching and learning. Opening Lines includes a cd-rom of supplementary documents, tools and resources. Regan A.R. Gurung, Nancy L. Chick, and Aeron Haynie, eds. These authors have clearly shown the value in looking for the signature pedagogies of their disciplines. Nothing uncovers hidden assumptions about desired knowledge, skills, and dispositions better than a careful examination of our most cherished practices. The authors inspire specialists in other disciplines to do the same. Furthermore, they invite other colleagues to explore whether relatively new, interdisciplinary fields such as Women's Studies and Global Studies have, or should have, a signature pedagogy consistent with their understanding of what it means to 'apprentice' in these areas. How do individual disciplines foster deep learning, and get students to think like disciplinary experts? With contributions from the sciences, humanities, and the arts, this book critically explores how to best foster student learning within and across the disciplines. This book represents a major advance in the Scholarship of Teaching and Learning (SoTL) by moving beyond individual case studies, best practices, and the work of individual scholars, to focus on the unique content and characteristic pedagogies of major disciplines. 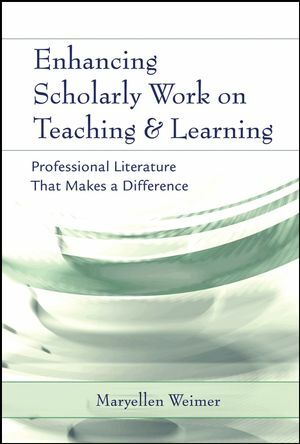 Each chapter begins by summarizing the SoTL literature on the pedagogies of a specific discipline, and by examining and analyzing its traditional practices, paying particular attention to how faculty evaluate success. 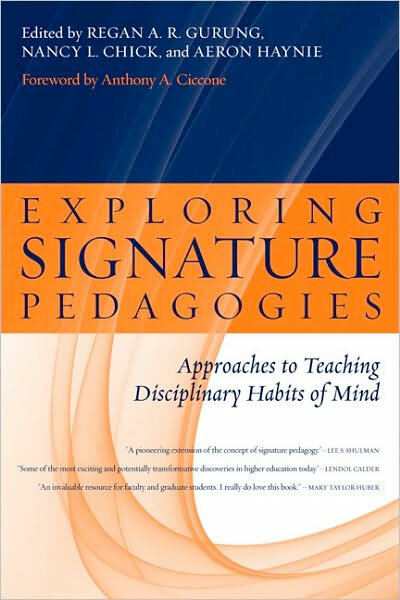 Each concludes by the articulating for its discipline the elements of a "signature pedagogy" that will improve teaching and learning, and by offering an agenda for futureresearch. Each chapter explores what the pedagogical literature of the discipline suggests are the optimal ways to teach material in that field, and to verify the resulting learning. 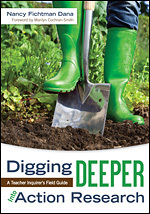 Each author is concerned about how to engage students in the ways of knowing, the habits of mind, and the values used by experts in his or her field. * Applying the goals of SoTL to enhance student learning and development. ch. 1 What Is the Scholarship of Teaching and Learning? ch. 2 Why Do SoTL? ch. 3 How Do I Get Started? ch. 4 How Can I Move My Project Forward? ch. 5 What Are the Practical and Ethical Issues I Must Consider? ch. 6 How Do I Design My SoTL Project? ch. 7 How Do I Make My SoTL Public and Document My Work? ch. 8 What Are the Disciplinary and Institutional Contexts of SoTL? ch. 9 Where Do We Go From Here? This guide provides prospective SoTL scholars with the necessary background information, foundational theory, tools, resources, and methodology to develop their own SoTL projects, taking the reader through the five stages of the process: Generating a research question; Designing the study; Collecting the data; Analyzing the data; and Presenting and publishing your SoTL project. Each stage is illustrated by examples of actual SoTL studies, and is accompanied by worksheets to help the reader refine ideas and map out his or her next steps. The process and worksheets are the fruit of the successful SoTL workshops the authors have offered at their institution for many years. SoTL differs from scholarly and reflective teaching in that it not only involves questioning one’s teaching or a teaching strategy, but also formally gathering and exploring evidence, researching the literature, refining and testing practices, and finally going public. 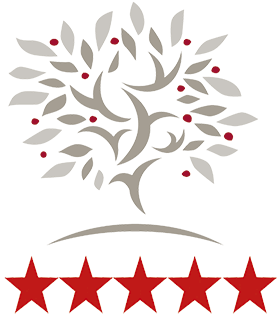 The purpose of SoTL is not just to make an impact on student learning, but through formal, peer-reviewed communication, to contribute to the larger knowledge base on teaching and learning. Gurung, Regan A.R. ; and Wilson, Janie H., eds. The Scholarship of Teaching and Learning (SoTL) should be an integral part of every academic’s life, representing not only the pinnacle of effortful teaching, but also standing side by side with more conventional disciplinary scholarship. Although practiced by many instructors for years, SoTL has garnered national attention resulting in a spate of new journals to publish pedagogical research. SoTL helps students, fosters faculty development, and has been integrated into higher education. This volume provides readers with challenges that will motivate them to engage in SoTL and take their pedagogical research further. 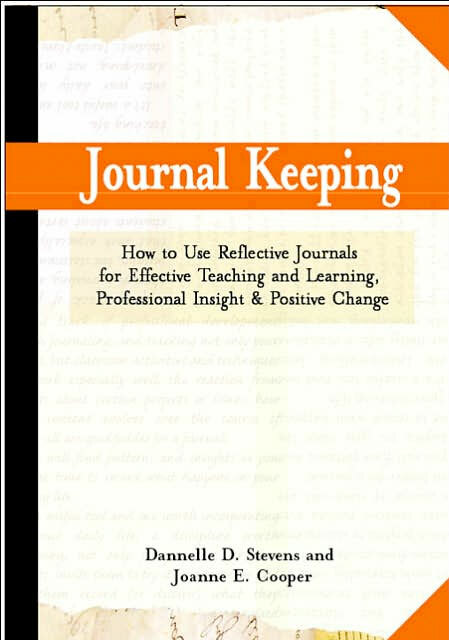 We include many key features aimed to help both the teacher new to research and SoTL and also researchers who may have a long list of scholarly publications in non-pedagogical areas and who have not conducted research. 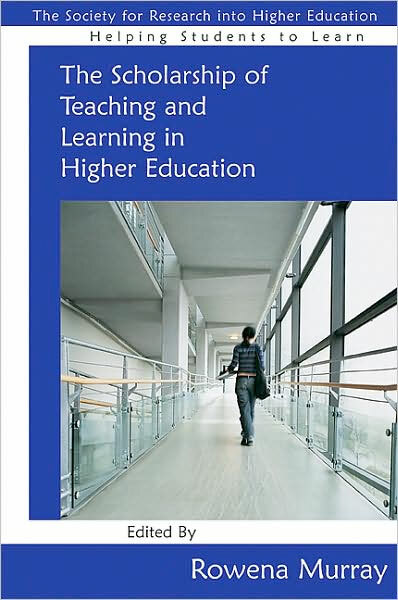 This chapter provides a brief history of the Scholarship of Teaching and Learning (SoTL), delineates the main audience for this volume, and presents a framework of the volume with a preview of each chapter. Coordinating SoTL and assessment efforts strengthens the processes of inquiry, evidence, and innovation that lead to the continual improvement of student learning. Examples are provided for how to work collaboratively with colleagues to use these processes to continually inform the teaching practices within classrooms, academic programs, and institutions. This chapter discusses how to improve validity in SoTL studies through generating appropriate measures and using designs that examine causality between an activity and students’ performance. This chapter suggests solutions to common practical problems in designing SoTL studies. In addition, the advantages and disadvantages of different types of designs are discussed. This chapter will provide potential models for analyzing learning data through a discussion of screening data and then analyzing that data using appropriate statistical techniques. This chapter discusses Institutional Review Boards (IRBs) as they apply to the SoTL. Specifically, it describes when SoTL projects must receive IRB approval, why they must get IRB approval, the review process, and some special issues of concern with regard to SoTL. This chapter gives reasons why writing is important, summarizes general writing guidelines common tomany academic disciplines, and provides specific writing guidelines that authors should use to make their manuscripts stronger and more likely to be acceptable to editors. From the perspective of a journal editor and experienced author, this chapter provides counsel on the "ins" and "outs" of publishing empirical research in peer-reviewed journals. This chapter discussesways that faculty development and teaching centers can foster the practice of SoTL and create a campus culture where SoTL is recognized as important scholarly work. Founded in 2001, JoSoTL is a peer reviewed forum for the dissemination of the Scholarship of Teaching and Learning in higher education for the community of teacher-scholars. Articles are theory-based and supported by evidence and promote effective practices in teaching and learning that add to the knowledge base. An open-access, peer-reviewed, international electronic journal, publishing articles in the scholarship of teaching and learning (SoTL). Published twice a year by the Coulter Faculty Commons for Excellence in Teaching & Learning at Western Carolina University. This research explores key features of the scholarship of teaching and learning presented in nine higher education pedagogical journals. In an effort to better understand the domain in which the journal Teaching Sociology resides, descriptive and comparative analyses indicate that there is notable variation in the type of knowledge offered to teacher-scholars in different disciplines and in the patterns of authorship in terms of solo or multiple authors and gender. Teaching Sociology appears to fare well in comparison with other journals for the criteria examined. The critical issue of determining how this knowledge serves us in practice remains. First in a three-part series: Mary Huber, Ph.D., introduces us to SoTL, the scholarship of teaching and learning, its motivation and history. Second in a three-part series: Mary Huber, Ph.D., introduces us to SoTL, the scholarship of teaching and learning, its motivation and history. Third in a three-part series: Mary Huber, Ph.D., introduces us to SoTL, the scholarship of teaching and learning, its motivation and history. Huber, Mary Taylor and Sherwyn P. Morreale, eds. "The Scholarship of Teaching in Theology and Religion: A Wabash Center Advisory Committee Conversation"
The use of reflection as a tool to support and develop practice is becoming increasingly recognised across education, healthcare and the social sciences. Reflection is assumed to create depth of knowledge and meaning, both for self and those practised upon. Running alongside the use of reflection is the prevalent use of action research which some see as a way of approaching the study of human beings from a philosophical perspective, in which sharing takes place within mutually supportive environments. As a result, many academics and practitioners suggest that one cannot improve the methodology of action research without considering philosophical reflection. In Action Research and Reflective Practice, the author argues that reflective practice and action research can become mechanistic in their use unless fresh creative approaches are employed. 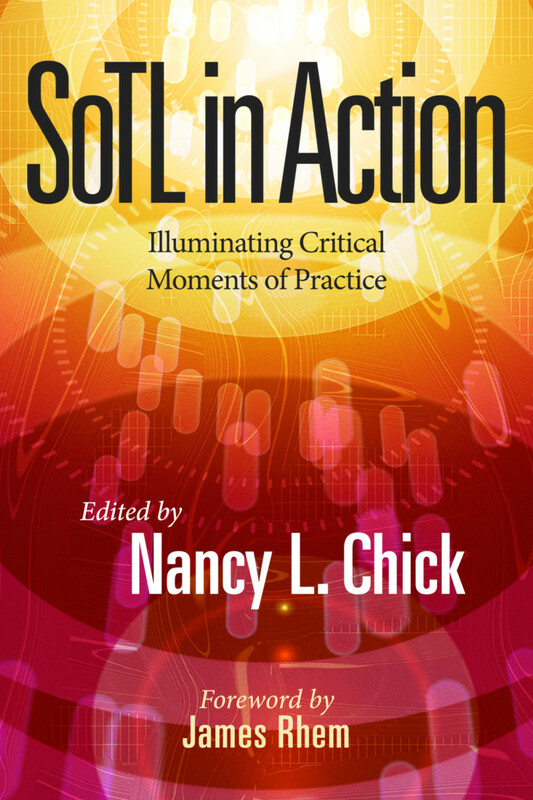 Exploring the tension between the use of evidence-based practice, based upon solid ‘objective’ research, and reflection, with its ‘subjectivity’ and personal perception, this book argues that reflection is research. 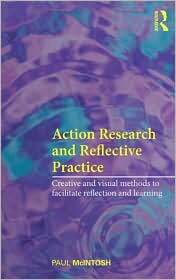 The author increases the use and effectiveness of both action research and reflection through the application of new creative and visual approaches. ch. 4 What do we mean by creativity? This article argues that there is an identifiable scholarship of teaching and learning in theology and religion that, though varied in its entry points and forms, exhibits standards of excellence recognizable in other forms of scholarship. Engaging in this scholarship enhances a professor’s possession of practice and often reveals insights into student learning and the contours of a field that can advance both educational and disciplinary projects. Through conversation with a form of the scholarship of teaching and learning that emerged most clearly in work associated with the Carnegie Foundation for the Advancement of Teaching, we describe starting points and generative assumptions that have been employed in the discourse of the scholarship of teaching and learning in theology and religion as they have emerged in submissions to Teaching Theology and Religion over the past decade and a half and point to its benefits. "The Scholarship of Teaching and Learning: Past Lessons, Current Challenges, and Future Visions"
"The Scholarship of Teaching: New Elaborations, New Developments"
Hutchings, Pat, and Shulman, Lee S.
Reviews programs such as the Carnegie Academy for the Scholarship of Teaching and Learning and literature on the scholarship of teaching at the higher education level. Suggests that the scholarship of teaching is not synonymous with excellent teaching, but requires faculty to "go meta," to systematically investigate questions of student learning. Also examines issues of credibility, openness, and sustainability. Locklin, Reid B.; Robinson, Joanne Maguire; and Pence, Nadine S.
How—and when—can we find time to conduct meaningful action research? Great ideas and thought-provoking questions can only blossom through methodical inquiry. Nancy Fichtman Dana steps in as your action-research coach and leads you on a journey through wonderings to real change in your classroom. ch. 1 Why Do Teacher Research Anyway? Kennesaw’s Center for Excellence in Teaching and Learning provides an extensive list of disciplinary and interdisciplinary journals in the scholarship of teaching and Learning (SoTL) focused on undergraduate and graduate education for teachers at colleges and universities, organized alphabetically. Last updated in July 2017. 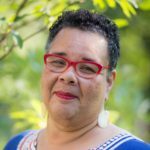 "Midrange Reflection: The Underlying Practice of Wabash Center Workshops, Colloquies, and Consultations "
This article argues that the primary intellectual embodiment of the Wabash Center's ethos of hospitality is a particular kind of reflection on teaching and learning, "midrange reflection." It defines and describes midrange reflection and then discusses the two essential skills required to facilitate it as distinct from other types of reflection and discussion: (1) the ability to identify issues in the life of a learning community, and (2) the ability to design sequences of questions and intellectual activities that promote reflection on those issues. As the underlying, if not defining practice of Wabash Center workshops, colloquies, and consultations, midrange reflection is crucial to the significant learning that occurs in Wabash Center programs and to participants’ ability to take their deeper understanding and insights back into their classrooms and professional lives. Chick, Nancy L.; Haynie, Aeron; and Gurung, Regan A. R., eds. What is distinctive about the ways specific disciplines are traditionally taught, and what kinds of learning do they promote? Do they inspire the habits of the discipline itself, or do they inadvertently contradict or ignore those disciplines? By analyzing assumptions about often unexamined teaching practices, their history, and relevance in contemporary learning contexts, this book offers teachers a fresh way to both think about their impact on students and explore more effective ways to engage students in authentic habits and practices. 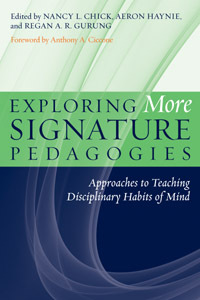 This companion volume to Exploring Signature Pedagogies covers disciplines not addressed in the earlier volume and further expands the scope of inquiry by interrogating the teaching methods in interdisciplinary fields and a number of professions, critically returning to Lee S. Shulman’s origins of the concept of signature pedagogies. This volume also differs from the first by including authors from across the United States, as well as Ireland and Australia. How Could I do Scholarship of Teaching and Learning? A brief article by Craig E. Nelson (Indiana University) describing several different "genres" in the scholarship of teaching and learning. 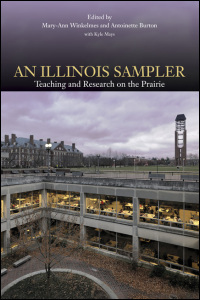 A bibliography of important essays about the scholarship of teaching, compiled by Kathleen McKinney at Illinois State University in Spring 2013. "Beyond the Scholarship of Teaching: Searching for a Unifying Metaphor for the College Teaching Profession"
An active blog spot supporting "efforts to make public the reflection and study of teaching and learning” — advice and tips for writing the scholarship of teaching.